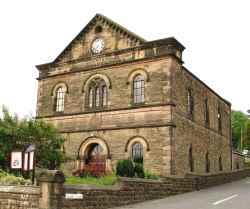 The Church Diary of Crich Baptist Church, with details of the regular and special meetings that we are connected with. From time-to-time we may also publicise meetings in other churches which we think would be helpful. The preacher at most of our meetings will be Pastor Chris Hand, unless otherwise stated. The Prayer Meeting and the Bible Study are held in the Schoolroom at the rear of the church. For further information concerning any of the above meetings, or if you have any other question, please feel free to get in touch with us by using the Contact Us form on the website.